Santa Ana Lane has claimed his fourth Group One win, storming home between runners in the VRC Sprint Classic at Flemington. A breathtaking win from Santa Ana Lane in the feature sprint race of the Melbourne Cup carnival at Flemington has also left trainer Anthony Freedman wondering what might have been. 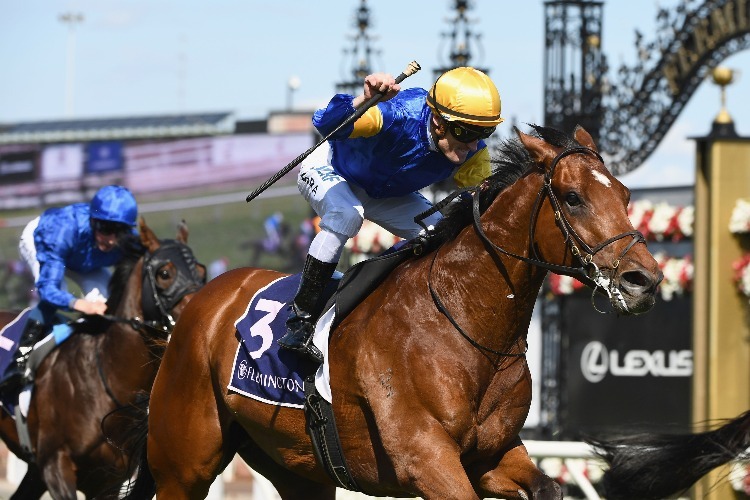 Mark Zahra made the most of fellow jockey Ben Melham's misfortune through a careless riding suspension, picking up the ride on Santa Ana Lane in Saturday's $1 million Group One VRC Sprint Classic (1200m) and guiding the gelding to a fast-finishing win. Santa Ana Lane had been targeted at The Everest in Sydney last month and won a key lead-up two weeks out from the $13 million race before striking a heavy track on the day when finishing midfield. On Saturday, Santa Ana Lane ($10) sat back in the field and burst through when the gaps appeared to beat In Her Time ($12) by a neck with 1-1/2-lengths to Jungle Cat ($26) and Pierata ($7) who dead-heated for third. Dual Everest winner Redzel was the well-backed $2.90 favourite and finished fifth. "When things are right for him, that's what he can do," Freedman said. "It was a shame the way it panned out in Sydney because I thought he was spot-on for Sydney. He just didn't get his chance there. "This wasn't an afterthought but we were always a bit dubious about him up the straight because he had had a couple of failures. "Mark rode him really well. It opened up for him and he was very strong late. "It's a nice consolation for the Everest." Freedman said a heavy downpour just before The Everest made the Randwick surface "slippery" which Santa Ana Lane didn't handle that day. "It's just a shame because it might be the one that got away. You never know," he said. Santa Ana Lane has emerged in the past couple of seasons as one of the country's best sprinters, with Saturday's victory his fourth at Group One level. "He's had a great 12 or 18 months and we'll put him away now and see what we can do next year," Freedman said. Zahra said it was a massive thrill to win but he also felt for his mate Melham, who was on track to watch the race. Redzel sat off the leader Invincible Star before making his run but jockey Kerrin McEvoy felt the good three-rated surface might have played against the favourite. "He gave a good kick but was whizzed by late," McEvoy said.